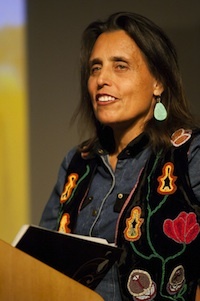 In a true sense of the words, Winona LaDuke is a force of nature. A few days ago, I was lucky enough to spend some time with Ms. LaDuke and ask which of her books is more ban-worthy. She was quick to tell me that The Militarization of Indian Country, which examines how the military has poisoned, murdered, and exterminated parts of indigenous populations, is probably her most threatening and radical work so far. But for those of us who don’t have time to commit to a book right now, here are some insightful and tasty morsels from Ms. LaDuke, who spoke at the Johns Hopkins Bloomberg School of Public Health on Tuesday at Center for a Livable Future’s Annual Dodge Lecture and addressed topics ranging from agricultural biodiversity, academic responsibility, the cool squash she’s growing, and the redemptive, restorative properties of food, in all its forms, be they medicine, ancestors, or nourishment. Again, on food: “Food is relatives. Those relatives might have wings or paws or fins or roots.